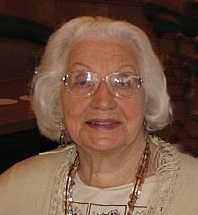 Bernice Eva "Babe" Hennings, nee Schneider, (97), a resident of Hoffman Estates for over 30 years, passed away on Monday, March 10, 2014; she was the beloved wife of the late Emil Hennings, Jr.; devoted mother to William (Carol) Hennings and Barbara (Christopher) Fahey; loving grandmother to Lauren (Chad Kaufman) Fahey, Margaret "Maggie" Fahey, Christopher "Kit" Fahey; dear sister of the late Catherine Cortez, Elizabeth Pieper, Margaret Eckert, Joseph Schneider and Jack Schneider. Dear daughter to the late Joseph and Barbara Schneider. For many years, Bernice was a welder for Schwinn Bicycles and played for their all- female baseball team. During World War II, she continued using her welding skills to make machine gun tripods for the US Army. She also worked at Hoffman Estates High School for over 10 years as a secretary. Later in life, Bernice and Emil moved to Geneva to be closer to their grandchildren and she worked at The Little Traveler until age 86. She will be remembered for her strength, loving spirit, and spitfire sense of humor. Arrangements by Ahlgrim & Sons Funeral and Cremation Services. A celebration of her life will be held at the home of her daughter on March 15th; info: 630-988-5953.